N2O4/UDMH propellant. Nitrogen tetroxide became the storable liquid propellant of choice from the late 1950's. Unsymmetrical Dimethylhydrazine ((CH3)2NNH2) became the storable liquid fuel of choice by the mid-1950's. Development of UDMH in the Soviet Union began in 1949. It is used in virtually all storable liquid rocket engines except for some orbital maneuvering engines in the United States, where MMH has been preferred due to a slightly higher density and performance. Specific impulse: 333 s. Specific impulse sea level: 285 s. Location: 1720. Optimum Oxidizer to Fuel Ratio: 2.61. Temperature of Combustion: 3,415 deg K. Ratio of Specific Heats: 1.25. Density: 1.18 g/cc. Characteristic velocity c: 1,720 m/s (5,640 ft/sec). Isp Shifting: 285 sec. Isp Frozen: 273 sec. Oxidizer Density: 1.450 g/cc. Oxidizer Freezing Point: -11 deg C. Oxidizer Boiling Point: 21 deg C. Fuel Density: 0.793 g/cc. Fuel Freezing Point: -57 deg C. Fuel Boiling Point: 63 deg C.
11D23 Kosberg N2O4/UDMH rocket engine. Study 1968. 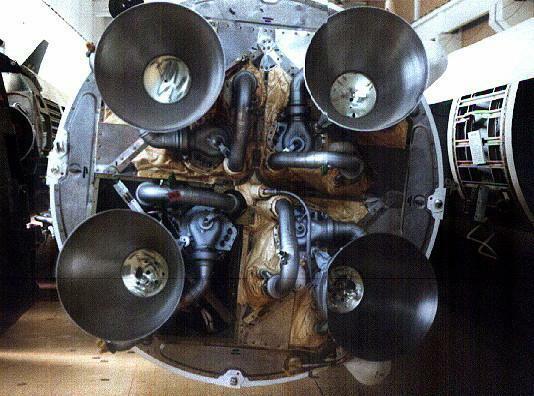 Engine used in Block 1 and Block 11 stages of LK-700 manned lunar lander. 11D416 Isayev N2O4/UDMH rocket engine. Study 1968. Three of these engines used for midcourse corrections and soft lunar landing in Block 11 and Block 1V stages of LK-700 manned spacecraft. 11D423 Izotov N2O4/UDMH rocket engine. 134 kN, for use in LK-700S manned lunar lander ascent stage. Development ended 1968. Based on UR-100 stage 2 engine. Gas generator cycle; 2 large turbine exhaust pipes. 11D428 Melnikov N2O4/UDMH rocket engine. Part of the Yantar-2K spy satellite orbital propulsion system. In production. The orbital maneuvering system of the Yantar-2K consisted of one 11D430, four 11D431, four 11D446, and eight 11D428. Up to 40,000 ignitions. 11D43 Glushko N2O4/UDMH rocket engine. Developed 1960-64. Low-expansion ratio gimbaled variant for Proton stage 1 concept. Configuration 4 x 8D43 clustered with 4 x 11D43 abandoned in favor of 6 x Glushko 11D48 in final Proton design. 11D430 Melnikov N2O4/UDMH rocket engine. Main engine of the Yantar-2K spy satellite orbital propulsion system. In production. The orbital maneuvering system of the Yantar-2K consisted of one 11D430, four 11D431, four 11D446, and eight 11D428. Up to 50 ignitions. Chamber Pressure: 9.00 bar. 11D431 Melnikov N2O4/UDMH rocket engine. Part of the Yantar-2K spy satellite orbital propulsion system. In production. The orbital maneuvering system of the Yantar-2K consisted of one 11D430, four 11D431, four 11D446, and eight 11D428. Up to 150,000 ignitions. 11D445 Melnikov N2O4/UDMH rocket engine. In Production. Propulsion system of the Yantar-2K military satellite descent capsule. Up to 10,000 ignitions. Thrust from 0,065 - 0,012 kN. 11D446 Melnikov N2O4/UDMH rocket engine. Part of the Yantar-2K spy satellite orbital propulsion system. In production. The orbital maneuvering system of the Yantar-2K consisted of one 11D430, four 11D431, four 11D446, and eight 11D428. Up to 40,000 ignitions. 11D458 Isayev N2O4/UDMH rocket engine. In Production. Small attitude control thruster in Briz upper stage propulsion system S5.98M. Total summary impulse 14,112 kg-s. Minimum impulse 4 kg-s. Specific impulse also reported as 275 sec. Oxidizer to Fuel Ratio: 2.0. 11D79 Stepanov N2O4/UDMH rocket engine. Blok D SOZ. In Production. Thrust 1.1-4.5 metric tons variable. 15D13 Klimov N2O4/UDMH rocket engine. Study 1968. Main engine for midcourse Block 1V ascent/trans-earth injection stage of LK-700 manned spacecraft. See also 11D423. 17D58E Isayev N2O4/UDMH rocket engine. In Production. Small attitude control thruster used in Briz, Briz-M upper stage propulsion system S5.98M. 17D61 Melnikov N2O4/UDMH rocket engine. Ikar stage 4 for Soyuz-Ikar. Design 1999. Derived from propulsion module of Yantar spy satellite, with over 30 flights to 1998. Increased versatility compared to Block L due to capability for 50 restarts. 37K-Mir Russian manned space station. Cancelled 1983. The basic 37K design consisted of a 4.2 m diameter pressurized cylinder with a docking port at the forward end. It was not equipped with its own propulsion system. 4D10 Isayev N2O4/UDMH rocket engine. R-27 / RSM-25 (SS-N-6). Out of Production. First engine system to be submerged in propellant tank. One main engine chamber plus unknown number (probably 4) of steering thrusters. Thrust 226 + 29 kN. 51T6B ZhRD Fakel N2O4/UDMH rocket engine. 8D423 Izotov N2O4/UDMH rocket engine. Production from 1964. Single chamber engine for UR-100 stage 2. Gas generator cycle with two large turbine exhaust pipes. First flight 1965. Later modified for the LK-700 manned lunar landeer. 8D725 Glushko N2O4/UDMH rocket engine. Developed 1963-1970. 10 to 12 metric ton thrust engine developed for an unstated military requirement. 8K94 stage N2O4/UDMH propellant rocket stage. Unusual designation for the upper stage of another Yangel project - possibly reflecting that the design originally was a stand-alone IRBM? Empty mass estimated. 8S816 N2O4/UDMH propellant rocket stage. Orevo has sectioned hardware. Total mass, sea level thrust accurate; Isp, empty mass and burn time estimated. Source: Placard, Orevo. 8S817 N2O4/UDMH propellant rocket stage. Orevo has sectioned hardware. Total mass, thrust accurate; Isp, empty mass and burn time estimated. Source: Placard, Orevo. A-350-1 N2O4/UDMH rocket stage. Mass 15,000 kg (33,069 lb). A-350-2 N2O4/UDMH rocket stage. Mass 15,000 kg (33,069 lb). Almaz APOS Russian manned space station. Cancelled 1966. The initial Almaz phase 1 configuration as conceived in 1965 included a single-launch station with its own VA crew return re-entry module. Almaz OPS Russian manned space station. Vladimir Chelomei's Almaz OPS was the only manned military space station ever actually flown. Almaz OPS-2 Russian manned space station. Configuration with two docking ports, one at each end of the station. Cancelled 1979. The initial Almaz military space station program planned in 1965 consisted of two phases. In the second phase sustained operations would be conducted with Almaz dual-docking port stations serviced by TKS manned resupply vehicles. Almaz-1B Russian civilian surveillance radar satellite. Study 1993. Almaz-2 Russian civilian surveillance radar satellite. Study 1995. Plans for an even more sophisticated and capable civilian Almaz 2 spacecraft were made in the early 1990's. Almaz 2's payload mass of 6. Almaz-T Russian civilian surveillance radar satellite. The results of the manned Almaz flights showed that manned reconnaissance from space was not worth the expense. Radar satellite (modified manned spacecraft) satellite for NPO Machinostroenye, USSR. Launched 1986-1991. Angara Briz M Russian space tug. Study 2004. Upper stage / space tug - in development 2004. Launched by Angara launch vehicle family. 8 restarts. Propellant ration 2.0:1. Angara Briz M stage N2O4/UDMH propellant rocket stage. Version proposed as Angara upper stage. 8 restarts. Propellant ration 2.0:1. Apollo CSM The Apollo Command Service Module was the spacecraft developed by NASA in the 1960's as a standard spacecraft for earth and lunar orbit missions. Manned spacecraft for earth orbit and lunar orbit satellite operated by NASA, USA. Launched 1967 - 1975. Apollo CSM Block I American manned spacecraft. The Apollo Command Service Module was the spacecraft developed by NASA in the 1960's as a standard spacecraft for earth and lunar orbit missions. Apollo RM American logistics spacecraft. Study 1967. In 1967 it was planned that Saturn IB-launched Orbital Workshops would be supplied by Apollo CSM spacecraft and Resupply Modules (RM) with up to three metric tons of supplies and instruments. Apollo SM American manned spacecraft module. 22 launches, 1964.05.28 (Saturn 6) to 1975.07.15 (Apollo (ASTP)). Ariane 1-1 N2O4/UDMH propellant rocket stage. .
Ariane 1-2 N2O4/UDMH propellant rocket stage. .
Ariane 2-1 N2O4/UDMH propellant rocket stage. .
Ariane 2-2 N2O4/UDMH propellant rocket stage. .
Ariane 4-0-4L N2O4/UDMH propellant rocket stage. .
Ariane 4-1 N2O4/UDMH propellant rocket stage. .
AVUM N2O4/UDMH propellant rocket stage. The AVUM propulsion module was composed of a UDMH/NTO bipropellant main engine with a re-ignition capability and a cold gas attitude control system, based on two clusters of three thrusters, each having a 50 N thrust. Big Gemini AM American manned spacecraft module. Reached mockup stage 1967. Earth orbit maneuver and retrofire. Briz-KM N2O4/UDMH propellant rocket stage. Briz KM differs from Briz K in having 'compact' components, special payload truss for Globalstar dispenser. The truss is 1.8 m in diameter and has a volume of 8.8 m3. Burlak Stage 1 N2O4/UDMH propellant rocket stage. Masses, thrust, specific impulse estimated based on total vehicle mass of 28.5 metric tons and first stage burn time of 140 seconds. Air launched from Tu-160 at 13,500 m, Mach 1.7 release conditions. Burlak Stage 2 N2O4/UDMH propellant rocket stage. Masses, thrust, specific impulse estimated based on total vehicle mass of 28.5 metric tons and first stage burn time of 140 seconds. Air launched from Tu-160 at 13,500 m, Mach 1.7 release conditions. CZ-1C-3 N2O4/UDMH propellant rocket stage. .
CZ-1C-3 engine Chinese N2O4/UDMH rocket engine. Development ended 1988. Used on CZ-1C launch vehicle. CZ-1D-2 N2O4/UDMH propellant rocket stage. .
CZ-2C/SD-2 N2O4/UDMH propellant rocket stage. Stretched version of CZ-2C second stage. Empty mass estimated. CZ-2C-1 N2O4/UDMH propellant rocket stage. .
CZ-2C-2 N2O4/UDMH propellant rocket stage. .
CZ-2E(A)-0 N2O4/UDMH propellant rocket stage. .
CZ-2E-1 N2O4/UDMH propellant rocket stage. .
CZ-2E-2 N2O4/UDMH propellant rocket stage. .
CZ-3-1 N2O4/UDMH propellant rocket stage. .
CZ-3-2 N2O4/UDMH propellant rocket stage. .
CZ-3A-1 N2O4/UDMH propellant rocket stage. .
CZ-3A-2 N2O4/UDMH propellant rocket stage. .
CZ-4A-1 N2O4/UDMH propellant rocket stage. .
CZ-4A-2 N2O4/UDMH propellant rocket stage. .
CZ-4A-3 N2O4/UDMH propellant rocket stage. .
CZ-4B-2 N2O4/UDMH rocket stage. 742.00 kN (166,808 lbf) thrust. Mass 39,600 kg (87,303 lb). CZ-4B-3 N2O4/UDMH rocket stage. 98.10 kN (22,054 lbf) thrust. Mass 15,200 kg (33,510 lb). Daniel-2 N2O4/UDMH propellant rocket stage. Diamant B-1 N2O4/UDMH propellant rocket stage. .
Diamant-1 N2O4/UDMH propellant rocket stage. .
Diamant-2 N2O4/UDMH propellant rocket stage. .
DST-100A Isayev N2O4/UDMH rocket engine. In Production. Bi-propellant hypergolic engine, pressure-fed. Larger nozzle and reduced chamber pressure to increase performance and lifetime in comparison to DST-100. 450,0000 ignitions. DST-200A Isayev N2O4/UDMH rocket engine. In Production. Bi-propellant hypergolic engine, pressure-fed. Larger nozzle and reduced chamber pressure to increase performance and lifetime compared to DST-200. 100,0000 ignitions. Europa-2 N2O4/UDMH propellant rocket stage. .
FB-1-1 N2O4/UDMH propellant rocket stage. .
FB-1-2 N2O4/UDMH propellant rocket stage. .
Fregat N2O4/UDMH propellant rocket stage. Upper stage developed from propulsion bus for Lavochkin lunar and planetary probes (Luna Ye-8, Mars M1, Fobos 1F). 20 restarts. Gemini LORV American manned lunar orbiter. Study 1967. This version of Gemini was studied as a means of rescuing an Apollo CSM crew stranded in lunar orbit. The Gemini would be launched unmanned on a translunar trajectory by a Saturn V.
Gemini LORV SM American manned spacecraft module. Study 1967. Calculated mass based on mission requirements, drawing of spacecraft, dimensions of propellant tanks. Gemini LSRS AM American manned spacecraft module. Study 1966. Calculated mass based on mission requirements, drawing of spacecraft, dimensions of propellant tanks. Gemini LSRS LM American manned spacecraft module. Study 1966. Calculated mass based on mission requirements, drawing of spacecraft, dimensions of propellant tanks. Gemini LSRS LOIM American manned spacecraft module. Study 1966. Calculated mass based on mission requirements, drawing of spacecraft, dimensions of propellant tanks. Gemini LSSS LM American manned spacecraft module. Study 1967. Calculated mass based on mission requirements, drawing of spacecraft, dimensions of propellant tanks. Gemini Lunar Surface Rescue Spacecraft American manned lunar lander. Study 1966. This version of Gemini would allow a direct manned lunar landing mission to be undertaken in a single Saturn V flight, although it was only proposed as an Apollo rescue vehicle. Gemini Lunar Surface Survival Shelter American manned lunar habitat. Study 1967. Prior to an Apollo moon landing attempt, the shelter would be landed, unmanned, near the landing site of a stranded Apollo Lunar Module. Grom-2 N2O4/UDMH propellant rocket stage. GSLV-0 N2O4/UDMH propellant rocket stage. .
GSLV-2 N2O4/UDMH propellant rocket stage. .
Ikar stage N2O4/UDMH propellant rocket stage. Derived from propulsion module of Yantar spy satellite, over 30 flights to 1998. 50 restarts. Isayev Polet/IS Isayev N2O4/UDMH rocket engine. Polyot/IS. Out of Production. Isayev TKS attitude Isayev N2O4/UDMH rocket engine. TKS, Almaz. In Production. Izotov LK-700 Izotov N2O4/UDMH rocket engine. LK-700. Developed 1966-69. Izotov UR-100 stage 2 vernier Izotov N2O4/UDMH rocket engine. UR-100 stage II vernier. Out of Production. Jericho-1-1 N2O4/UDMH propellant rocket stage. KDU-426 Isayev N2O4/UDMH rocket engine. Soyuz-T orbital correction engine. In Production. Pressure-fed engine. Used as long duration engine for correction orbits of satellites. KRD-442 Isayev N2O4/UDMH rocket engine. Orbital propulsion for FGB-derived modules for Mir and ISS. In Production. Main and low-thrust mode. Operation of turbopump without chamber used to pump propellants into tanks from Progress tankers. KRD-61 Isayev N2O4/UDMH rocket engine. Luna Ye-8. Out of Production. Spacecraft maneuvering engine for ascent stage of Luna moon sample return missions. First flight 1969. KRD-79 Isayev N2O4/UDMH rocket engine. Salyut 6, 7and Mir orbital propulsion maneuvering engine. In Production. Probably derived from engine of propulsion system KDU-426. Pressure fed engine. KTDU-417-B Isayev N2O4/UDMH rocket engine. Luna 15-24 used this low thrust engine in system KTDU-417 for soft-landing on the moon. Out of Production. Pressure-fed engine; could be throttled to 2.06 kN. KTDU-425 Isayev N2O4/UDMH rocket engine. Mars 2 and 3 maneuver engine. Out of Production. Pump-fed engine. Could be throttled to 7.05 kN / 9.5 MPa / 2850 m/s. . Chamber pressure 133,2 - 95 bar. KTDU-425A Isayev N2O4/UDMH rocket engine. Mars 4-7, Venera 9-16, Vega 1-2, and Fobos 1-2 maneuvering engine. Out of Production. Could be throttled to 9.86/9.5/2870. Chamber pressure 149 - 95 bar. First flight 1973. KTDU-80 Isayev N2O4/UDMH rocket engine. Soyuz TM, Progress M. In Production. Propulsion system included 4 spherical tanks for a total of 880 kg propellant. Developed from NII Mash experimental thruster. 3 thrust levels by 4 valves. LB-40 N2O4/UDMH propellant rocket stage. .
LCLV-1 N2O4/UDMH propellant rocket stage. .
LCLV-2 N2O4/UDMH propellant rocket stage. .
LCLV-3 N2O4/UDMH propellant rocket stage. .
LEK PS Russian manned spacecraft module. Study 1973. Descent stage very similar in appearance to that of Apollo LM, with same function - descent from lunar orbit to landing of crewed module on surface of moon. Landing stage - Carry LEK ascent stage from lunar orbit to lunar surface; act as launching platform for LEK ascent stage. LEK VS Russian manned spacecraft module. Study 1973. Ascent stage, carried a crew of three from the lunar surface to trans-earth trajectory. Contained within the pressurized cabin was a Soyuz descent module for reentry by the crew into the earth's atmosphere. Ascent stage - Carry crew and Soyuz descent module from lunar surface to trans-earth trajectory. Provide crew quarters and midcourse corrections during return journey from lunar surface to earth. LK Russian manned lunar lander. The LK ('Lunniy korabl' - lunar craft) was the Soviet lunar lander - the Russian counterpart of the American LM Lunar Module. Manned Lunar lander test satellite, Russia. Launched 1970 - 1971. LK Energia PS Russian manned spacecraft module. Study 1988. Descent stage similar in appearance to Apollo LM and LEK stages, but of differing dimensions. Descent from lunar orbit to lunar surface, launch platform for ascent stage. LK Energia VS Russian manned spacecraft module. Study 1988. Although similar in appearance to LEK ascent stage, 80% smaller and no descent module for reentry into earth's atmosphere. Ascent from lunar surface to lunar orbit, dock with LOK Energia. LK-1 PAO Russian manned spacecraft module. Cancelled 1965. Calculated masses, specific impulse based on mission requirements and drawing of spacecraft. Equipment-engine section. LK-3 Russian manned lunar lander. Reached mock-up stage, 1972. The LK-3 was Chelomei's preliminary design for a direct-landing alternative to Korolev's L3 manned lunar landing design. LK-700 Russian manned lunar lander. Chelomei's direct-landing alternative to Korolev's L3 manned lunar landing design. Developed at a low level 1964 to 1974, reaching mockup and component test stage. LK-700 Block 1 Russian manned spacecraft module. Study 1968. Three identical stages of 34,491 kg each clustered around the core. Translunar Injection Stage. LK-700 Block 11 Russian manned spacecraft module. Study 1968. Differed from the lateral Block 1 stages in having an engine unit for orientation of the assembly. Main engine of 23,500 kgf and three engines for soft landing / midcourse maneuvers of 1,670 kgf each. Midcourse man oeuvre/lunar braking stage. LK-700 Block 111 Russian manned spacecraft module. Study 1968. Soft Landing Stage. LK-700 Block 1V Russian manned spacecraft module. Study 1968. Main engine of 13,400 kgf and three engines for soft landing / midcourse maneuvers of 1,670 kgf each. Trans-earth injection / midcourse man oeuvre stage. LK-700 VA Russian manned spacecraft module. Study 1968. VA Re-entry Capsule. LM Langley Light American manned lunar lander. Study 1961. This early open-cab single-crew Langley lunar lander design used storable propellants, resulting in an all-up mass of 4,372 kg. LOK Energia PAO Russian manned spacecraft module. Study 1988. The LOK provided a pressurized volume for three crew. Within the cabin was a descent module of the same configuration as Soyuz, but almost 50% larger. Equipment-engine section - Lunar orbit maneuver, trans-orbit propulsion, pressurized crew quarters. LOK PAO Russian manned spacecraft module. 2 launches, 1971.06.26 (N-1 6L) to 1972.11.23 (LOK). Unique PAO developed for Soyuz lunar orbiter. Powerful sophisticated engine for lunar orbit rendezvous maneuvers and trans-earth injection. Equipment-engine section. Martlet 4L-2 N2O4/UDMH propellant rocket stage. .
Martlet 4L-3 N2O4/UDMH propellant rocket stage. .
MD-620 engine Dassault N2O4/UDMH rocket engine. Mir The Mir space station was the last remnant of the once mighty Soviet space program. The core module was launched on 1986-02-20. It was built to last only five years, and consisted of a station core derived from the Salyut space station, with docking ports to accomodate additional modules for specialized research. As the Soviet Union collapsed Mir stayed in orbit, but the final modules were were delivered years late and could only be completed with American financial assistance. The Mir complex in the end consisting of 7 modules with 11.5 metric tons of scientific equipment. It cost $220 to $240 million per year to keep in operation. Kept flying over a decade beyond its rated life, Mir proved a source of pride to the Russian people and proved the ability of their cosmonauts and engineers to improvise and keep operations going despite all manner of challenges and mishaps. Monoblock UR-500-1M N2O4/UDMH propellant rocket stage. Original conventional 'Monoblock' design for Proton first stage. Monoblock UR-500-2 N2O4/UDMH propellant rocket stage. Original Proton second stage design. Monoblock UR-500-3 N2O4/UDMH propellant rocket stage. Original Proton third stage design. MR-UR-100 BR Yuzhnoye N2O4/UDMH rocket engine. MR-UR-100 St 1 N2O4/UDMH rocket stage. 1236.00 kN (277,864 lbf) thrust. Mass 59,000 kg (130,073 lb). MR-UR-100-2 N2O4/UDMH rocket stage. 142.00 kN (31,923 lbf) thrust. Mass 10,000 kg (22,046 lb). MR-UR-100-3 N2O4/UDMH rocket stage. Mass 1,000 kg (2,205 lb). NA 802 Soleil C SEREB solid rocket engine. NA 803 Soleil SEREB solid rocket engine. NII 612 kgf NII Mash N2O4/UDMH rocket engine. experimental 612.25 kgf / 0.071 metric tons thrust / 0.031tf. Developed. Experimental thruster, 3 thrust levels by 4 valves: 6000 N, 0.7 N, 0.3 N. Specific impulse 326 - 286 sec. Perimetr Stage 1 N2O4/UDMH rocket stage. 1236.00 kN (277,864 lbf) thrust. Mass 59,000 kg (130,073 lb). PF N204/UDMH-2165k Notional N2O4/UDMH rocket engine. Study 1967. Used on Saturn LCB-Storable-250 launch vehicle. PF N204/UDMH-2912k Notional N2O4/UDMH rocket engine. Study 1967. Used on Saturn LCB-Storable-140 launch vehicle. Polyblock UR-500-1P N2O4/UDMH propellant rocket stage. Original 'Polyblock' design for Proton first stage. This was selected configuration; although somewhat greater in dry mass, it had the advantages of shorter length. Press Fed 1000k TRW N2O4/UDMH rocket engine. Study 1968. 1960's designs for 'big dumb booster'. Used on LCLV launch vehicle. Press Fed 200k TRW N2O4/UDMH rocket engine. Study 1968. 1960's designs for 'big dumb booster'. Used on LCLV launch vehicle. Press Fed 5748k TRW N2O4/UDMH rocket engine. Study 1968. 1960's designs for 'big dumb booster'. Used on LCLV launch vehicle. Progress M Russian logistics spacecraft. Progress M was an upgraded version of the original Progress. New service module and rendezvous and docking systems were adopted from Soyuz T. Cargo satellite operated by RKK > RAKA, Russia. Launched 1989 - 2009. Progress M PAO Russian manned spacecraft module. Operational, first launch 1989.08.23 (Progress M-1). Improved PAO service module derived from Soyuz 7K-S with pressure-fed main engines and unitary RCS/main engine propellant feed system. Equipment-engine section. Proton The Proton launch vehicle has been the medium-lift workhorse of the Soviet and Russian space programs for over fifty years. Although constantly criticized within Russia for its use of toxic and ecologically-damaging storable liquid propellants, it has out-lasted all challengers. The latest potential replacement, the Angara, may not be operational until the 2020's. Proton K-1 Proton K stage 1. Proton K-2 Proton K stage 2. Proton K-3 Proton K stage 3. Proton KM-4 Briz M N2O4/UDMH propellant rocket stage. New upper stage for Proton, replacing Energia Corporation's Block DM, making Proton an all-Khrunichev launch vehicle. The Khrunichev-built Briz-M upper stage is a derivative of the flight-proven Briz -K stage (as used on the Rokot booster). Proton M-1 Proton M Stage 1. Proton M-3 Proton M Stage 3. PSLV-2 N2O4/UDMH propellant rocket stage. .
R-21-1 N2O4/UDMH propellant rocket stage. R-29-1 N2O4/UDMH propellant rocket stage. R-36-0-1 N2O4/UDMH propellant rocket stage. .
R-36-0-2 N2O4/UDMH propellant rocket stage. .
R-36-1 N2O4/UDMH propellant rocket stage. Verniers 4 x RD-68M, 285 kN, maximum 42 degree gimbal angle. R-36-2 N2O4/UDMH propellant rocket stage. Verniers 4 x RD-69M, 54.3 kN, maximum 50 degree gimbal angle. R-36M-1 N2O4/UDMH rocket stage. 4522.00 kN (1,016,586 lbf) thrust. Mass 210,000 kg (462,971 lb). R-36M-2 N2O4/UDMH rocket stage. 760.00 kN (170,855 lbf) thrust. Mass 49,000 kg (108,027 lb). R-36M2-1 N2O4/UDMH propellant rocket stage. Surplus ICBMs; failures based on ICBM tests through 1994. R-36M2-2 N2O4/UDMH propellant rocket stage. Surplus ICBMs; failures based on ICBM tests through 1994. R-36M2-3 N2O4/UDMH propellant rocket stage. Main engine could be throttled to 800 kgf. R-39 St2 Makeyev N2O4/UDMH rocket engine. R-39 St3 Makeyev N2O4/UDMH rocket engine. R-56 Block A N2O4/UDMH propellant rocket stage. .
R-56 Block B N2O4/UDMH propellant rocket stage. .
R-56 Block O N2O4/UDMH propellant rocket stage. Empty mass estimated (rounded figures given in source material indicates impossible 31 metric tons gross with 30 metric tons propellant). R6-117 Chelomei N2O4/UDMH rocket engine. LK-1 Blok A. Developed 1964-66. Developed in cooperation with OKB-117 on the basis of the latter's main engine for the UR-100 stage II. RD R-21 SKB-385 N2O4/UDMH rocket engine. RD R-27 Makeyev N2O4/UDMH rocket engine. RD R-29 (1) Makeyev N2O4/UDMH rocket engine. RD R-29 (2) Makeyev N2O4/UDMH rocket engine. RD R-29R (1) Makeyev N2O4/UDMH rocket engine. RD R-29R (2) Makeyev N2O4/UDMH rocket engine. RD R-29RM (2) Makeyev N2O4/UDMH rocket engine. RD R-29RM (3) Makeyev N2O4/UDMH rocket engine. RD-0202 Kosberg N2O4/UDMH rocket engine. UR-200 stage 1. Engine unit (DU - dvigatelnaya ustanovka) consisting of 1 RD-0204 for tank pressurization and three RD-0203. First flight 1963. RD-0207 Kosberg N2O4/UDMH rocket engine. UR-200 stage 2 vernier. Developed 1961-64. Gas generator cycle. Four vernier thrusters. First flight 1964. RD-0216 Kosberg N2O4/UDMH rocket engine. UR-100 stage 1. Staged combustion cycle. Includes tank pressurization system (RD-0217 without tank press.). First launch November 1963, manufactured until 1974, operational until 1991. First flight 1965. RD-0217 Kosberg N2O4/UDMH rocket engine. UR-100, UR-100K stage 1. Out of Production. Staged combustion cycle. Version of RD-0216 without tank pressurization system. Manufacturing until 1974, operational use until 1991. RD-0221 Kosberg N2O4/UDMH rocket engine. upper stage of unnamed missile by Mishin. Developed 1965-70. RD-0225 Kosberg N2O4/UDMH rocket engine. Almaz space station orbital maneuvering. Hardware. Originally designed for UR-100 follow-on spaceships. Two engines used on Almaz space station for orbital maneuvering, Pressure fed. First flight 1974. RD-0228 Kosberg N2O4/UDMH rocket engine. R-36M / RS-20A (SS-18 mod-1) stage 2. Out of Production. Comprises single-chamber main engine RD-0229 plus four-chamber steering engine RD-0230. Further developed to RD-0255. RD-0229 Kosberg N2O4/UDMH rocket engine. R-36M / RS-20A (SS-18 mod-1) stage 2. Out of Production. Main engine. Staged combustion cycle. Used on Ikar launch vehicle. First flight 1974. RD-0230 Kosberg N2O4/UDMH rocket engine. R-36M / RS-20A (SS-18 mod-1) stage 2 vernier. Out of Production. Vernier engine. Gas generator cycle. First flight 1974. RD-0231 Kosberg N2O4/UDMH rocket engine. P-700 Granit. Out of Production. Staged combustion cycle. First flight 1970. RD-0232 Kosberg N2O4/UDMH rocket engine. UR-100N / Rokot Stage 1. Engine unit (DU - dvigatelnaya ustanovka) consisting of 1 RD-0234 for tank pressurization and three RD-0233. First flight 1972. RD-0233 Kosberg N2O4/UDMH rocket engine. UR-100N / RS-18 (SS-19) stage 1. Out of Production. Staged combustion cycle. First flight 1974. RD-0234 Kosberg N2O4/UDMH rocket engine. UR-100N / RS-18 (SS-19) stage 1. Out of Production. Staged combustion cycle. Modification of RD-0233 including tank pressurization system. First flight 1974. RD-0235 Kosberg N2O4/UDMH rocket engine. UR-100N / RS-18 (SS-19) stage 2. Main engine based on RD-0217 with larger nozzle for altitude operation. Staged combustion cycle. First flight 1972. RD-0236 Kosberg N2O4/UDMH rocket engine. UR-100N / RS-18 (SS-19) stage 2 vernier. Out of Production. Developed in 1969-1974 / problems not solved until 1978. Vernier engines. Gas generator cycle. RD-0237 Kosberg N2O4/UDMH rocket engine. UR-100N / RS-18 (SS-19) stage 3. MIRV service block. Open cycle. Analogous to RD-0225, pressure fed. Steering engine for space vehicles gimbaling +/- 45 degree. First flight 1972. RD-0242 Kosberg N2O4/UDMH rocket engine. sea-based missile booster stage developed 1977-83 (Burlak). First concept planned N2O4/kerosene as propellant, but changed to N2O4/UDMH. Single ignition, 297 development tests. 50 engines for sale. RD-0243 Kosberg N2O4/UDMH rocket engine. R-29RM stage 1. Out of Production. Consisted of single-chamber main engine RD-0244 plus four-chamber steering engines RD-0245 driven by turbine exhaust gas. Engine submerged in propellant tank. RD-0244 Kosberg N2O4/UDMH rocket engine. R-29RM / RSM-54 (SS-N-23) stage 1. Out of Production. Main engine in system RD-0243. Staged combustion cycle. Submerged in propellant tank. First flight 1985. RD-0245 Kosberg N2O4/UDMH rocket engine. R-29RM / RSM-54 (SS-N-23) stage 1 vernier. Out of Production. Four-chamber steering engine in system RD-0243 driven by turbine exhaust gas. First flight 1985. RD-0246 Kosberg N2O4/UDMH rocket engine. Design concept. Project for further development of RD-0243. RD-0250 Kosberg N2O4/UDMH rocket engine. Further development of RD-0235 main engine for projected modification of stage 2 of classified Chelomei rocket. Development ceased during study phase. Staged combustion cycle. RD-0251 Kosberg N2O4/UDMH rocket engine. Further development of RD-0236 steering engine for projected modification of stage 2 of classified Chelomei rocket. Development ceased during study phase. Gas generator cycle. RD-0255 Kosberg N2O4/UDMH rocket engine. R-36M2 / RS-20V (SS-18 Mod-4) stage 2. Comprises of single-chamber main engine RD-0256 plus four-chamber steering engines RD-0257. Development based on RD-0228 with thrust increase by 11%. First flight 1986. RD-0256 Kosberg N2O4/UDMH rocket engine. R-36M2 / RS-20V (SS-18 Mod-4) stage 2. Out of Production. Main engine of system RD-0255. Staged combustion cycle. First flight 1987. RD-0257 Kosberg N2O4/UDMH rocket engine. R-36M2 / RS-20V (SS-18 Mod-4) stage 2 vernier. Out of Production. Steering engine of system RD-0255. Gas generator cycle. First flight 1987. RD-250 Glushko N2O4/UDMH rocket engine. R-36-0 stage 1, Tsyklon 2 stage 1. Out of Production. Assembly of 3 RD-250 units make RD-251. RD-251 Glushko N2O4/UDMH rocket engine. R-36-0 stage 1, Tsyklon 2 stage 1. In production. Assembly of 3 RD-250-type units. First flight 1965. RD-252 Glushko N2O4/UDMH rocket engine. R-36-0 stage 2; Tsyklon 2 stage 2. In production. Used modified chamber from RD-219, nozzle is conventional, so performance is higher. First flight 1965. RD-253 Glushko N2O4/UDMH rocket engine. In Production. Version of RD-253 with thrust increased by 7%. Included an additional gas generator for tank pressurization. First flight 1986. RD-253-11D48 Glushko N2O4/UDMH rocket engine. Six gimbaled single chamber RD-253s provide the first stage power for the UR-500 Proton launch vehicle and the third stage of the planned UR-700 moon launcher. First flown in 1965. RD-253-14D14 Glushko N2O4/UDMH rocket engine. Proton KM-1. In production. Developed in 1990s. First flight 1999. RD-253-UR-700 Glushko N2O4/UDMH rocket engine. Designed 1964-1968. UR-700 Stage 3. Development of RD-253 with increased expansion ratio for upper stage use. RD-254 Glushko N2O4/UDMH rocket engine. N-1 upper stage, UR-700 stage 3. Proposed for use in N-1. High altitude version of RD-253 for 2nd stages. Later proposed for R-56 and UR-700 upper stages. RD-261 Glushko N2O4/UDMH rocket engine. Tsyklon 3 stage 1. In production. Based on RD-251 First flight 1977. RD-262 Glushko N2O4/UDMH rocket engine. Tsyklon 3 stage 2. In production. Based on RD-252 First flight 1977. RD-263 Glushko N2O4/UDMH rocket engine. R-36M / RS-20A (SS-18 Mod 1) stage 1. Out of Production. Four RD-263 engines combined into RD-264 system. RD-263F Glushko N2O4/UDMH rocket engine. Developed 1980. Project to upgrade RD-263. Upgrade was realized in RD-273 engine. RD-264 Glushko N2O4/UDMH rocket engine. R-36M / RS-20A (SS-18 Mod 1) stage 1. Consists of four RD-263 engines. Used on Dnepr launch vehicle. First flight 1986. RD-268 Glushko N2O4/UDMH rocket engine. MR-UR-100 / RS-16 (SS-17) stage 1. Out of Production. First flight 1976. Modification of RD-263 engine. First flight 1990. RD-270 Glushko N2O4/UDMH rocket engine. UR-700, R-56 stage 1. Development ended 1968. Developed 1962-1971, largest rocket engine ever built in the Soviet Union, answer to F-1. Tested but cancelled before combustion instability problems solved. RD-273 Glushko N2O4/UDMH rocket engine. Developed 1975-82. Upgrade of RD-263 in 1982 based on RD-263F project. RD-274 Glushko N2O4/UDMH rocket engine. Developed 1975-85. Upgrade of RD-264 engine with increased chamber pressure and thrust. Development stopped due to problems with turbopump shaft balance. RD-275 Glushko N2O4/UDMH rocket engine. Proton stage 1. In Production. Uprated version of RD-253, developed in the 1980's. First flight 1986. RD-68M Yuzhnoye N2O4/UDMH rocket engine. R-36 stage 1 attitude control engine. Out of Production. 4 nozzles, maximum 42 degree gimbal angle. RD-69M Yuzhnoye N2O4/UDMH rocket engine. R-36 stage 2 attitude control engine. Out of Production. 4 nozzles, maximum 50 degree gimbal angle. RD-854 Yuzhnoye N2O4/UDMH rocket engine. R-36orb (SS-X-10) orbital stage. Out of Production. Thrust vector control by 4 nozzles fed from gas generator. RD-855 Yuzhnoye N2O4/UDMH rocket engine. Tsyklon stage 1 attitude control engine. Out of Production. Four-chamber pump-fed single-run engine burned hypergolic propellants in a gas generator scheme. RD-856 Yuzhnoye N2O4/UDMH rocket engine. Tsyklon stage 2 attitude control engine. Out of Production. Autonomous four-chamber pump-fed single-run engine burned hypergolic propellants in a gas generator scheme. RD-857 Yuzhnoye N2O4/UDMH rocket engine. RT-20P missile stage 2. Out of production. Designed for second stage of mixed propulsion missile, only flight tests. Thrust vector control by secondary gas injection into nozzle. First flight 1967. RD-858 Yuzhnoye N2O4/UDMH rocket engine. Primary engine for LK manned lunar lander. Propulsion cluster provided the variable thrust needed for a soft landing onto the lunar surface, then restarted for injection into lunar orbit. Flown 1970. RD-859 Yuzhnoye N2O4/UDMH rocket engine. LK lunar lander reserve engine. Hardware. Backup engine for the LK manned lunar lander in the event the primary RD-858 engine failed. Restart within three seconds after shut down. Flight tests 1970. RD-860 Yuzhnoye N2O4/UDMH rocket engine. Upper stages. Developed 1972. Engine used a novel scheme combining an existing proven combustion chamber but using a pneumatic pump for propellant supply. RD-861 Yuzhnoye N2O4/UDMH rocket engine. Tsyklon 2 and 3 stage 3; Ikar. In production. Based on RD-854. Thrust vector control by 4 nozzles (thrust 98 N each) fed from a gas generator. First flight 1965. RD-861G Yuzhnoye, Fiat Avio N2O4/UDMH rocket engine. Vega upper stage. Developed 1996-. Proposed uprate of RD-861 engine. Thrust vector control by gimbal, roll control by 4 nozzles (thrust 29 N each). RD-861K Yuzhnoye N2O4/UDMH rocket engine. Tsyklon 2 and 3 stage 3; Ikar. Developed 2005. High pressure fuel was used to gimbal the engine in two planes, replacing four thrust vector engines on the basic RD-861. RD-862 Yuzhnoye N2O4/UDMH rocket engine. MR-UR-100 / RS-16 (SS-17) stage 2. Out of Production. Based on RD-857. Thrust vector control by secondary gas injection into nozzle. Roll control via special small jet nozzles. RD-863 Yuzhnoye N2O4/UDMH rocket engine. MR-UR-100 / RS-16 (SS-17) stage 1 attitude control engine. Out of Production. RD-864 Yuzhnoye N2O4/UDMH rocket engine. Application: R-36M UTTKh / RS-20B (SS-18 Mod 2) vehicle bus. Out of Production. Two thrust levels. The four thruster swing out of the stage housing before use. Chamber pressure 41 / 17 bar. Specific impulse 309 / 298 sec. RD-866 Yuzhnoye N2O4/UDMH rocket engine. RT-23 MIRV-bus. Out of Production. Engine consisted of two turbopumps with gas generators and two feeders; a single chamber main engine; and 16 liquid thrusters for attitude control and translation. RD-868 Yuzhnoye N2O4/UDMH rocket engine. Apogee stage. Developed 1983-. In development in 1996. One main and an unknown number of control thrusters. 23.25 + 0.03 kN. Chamber pressure 91.5 / 6.9 bar. Specific impulse 325 / 230 sec. RD-869 Yuzhnoye N2O4/UDMH rocket engine. R-36M2 vehicle bus. Based on RD-864. Two thrust levels. The four thrusters swing out of the stage housing before use. Chamber pressure 41 / 17 bar. Diameter 3,0 / 4,02 m. First flight 1986. RDMT-0.4 X NII Mash N2O4/UDMH rocket engine. In Production. Experimental low-thrust thruster. Chamber from niobium alloy. Chamber pressure 41 / 17 bar. Specific impulse 313 / 302,3 sec. RDMT-100 NII Mash N2O4/UDMH rocket engine. Salyut, Mir, Soyuz-T and -TM, Progress, Kosmos-satellites. In Production. Low-thrust attitude control thruster. RDMT-12 Isayev / NII Mash N2O4/UDMH 12-13 N low-thrust attitude control thruster. Used on Almaz, Kvant, Kristall, Spektr, and Priroda spacecraft; and in Briz and Briz-M upper stages. In Production. Predecessor was RDMT-400. Thrust given as 0.0133 N / Isp = 247 and 270 sec in S5.98M Briz, Briz-M upper stage application. RDMT-135 NII Mash N2O4/UDMH rocket engine. Salyut, Mir, Soyuz-T and -TM, Progress, Kosmos-satellites. In Production. Low-thrust attitude control thruster. RDMT-200 NII Mash N2O4/UDMH rocket engine. Almaz. In Production. Low-thrust attitude control thruster. RDMT-400 NII Mash N2O4/UDMH rocket engine. Almaz, Kvant, Kristall, Spektr, Priroda. In Production. Low-thrust attitude control thruster. Used in Isayev 11D458 engine. RDMT-400 X NII Mash N2O4/UDMH rocket engine. Developed 1980's. Experimental low-thrust thruster. Carbon combustion chamber. Mass may be chamber only. RDMT-400A NII Mash N2O4/UDMH rocket engine. Developed 1980's. Experimental low-thrust thruster. Niobium combustion chamber with coating. RDMT-50 NII Mash N2O4/UDMH rocket engine. Kosmos satellites. In Production. Low-thrust attitude control thruster. RDMT-8 X NII Mash N2O4/UDMH rocket engine. Developed 1980's. Experimental low-thrust thruster. Rescue Gemini American manned rescue spacecraft. Study 1966. A version of Gemini was proposed for rescue of crews stranded in Earth orbit. This version, launched by a Titan 3C, used a transtage for maneuvering. Rif-3 N2O4/UDMH propellant rocket stage. Rokot-3 Briz N2O4/UDMH propellant rocket stage. High performance storable liquid engine. The basic stage can be adapted with 'wrap-around' propellant tanks for Proton booster applications. RT-23-3 N2O4/UDMH propellant rocket stage. S5.51 Isayev N2O4/UDMH rocket engine. Hardware 1969. Complex engine used to maneuver the LOK to a rendezvous with the LK lander in lunar orbit, then propel the LOK out of lunar orbit. Verniers included for midcourse corrections. S5.92 Isayev N2O4/UDMH rocket engine. Phobos propulsion module, later adapted as Fregat upper stage. In production. Gas generator cycle. Nominal and low-thrust thrust levels. S5.98M Isayev N2O4/UDMH rocket engine. Used on Briz and Briz-M upper stages. Engine system consists of: main engine (2000 kgf, Isp=325.5s) + 4x11D458 (40 kgf, Isp=252s) + 12x17D58E (1.36 kgf, Isp=247s). 8 restarts. First flight 1990. Salyut 6 Russian manned space station, launched 1977-09-29. The Salyut 6 space station was the most successful of the DOS series prior to Mir. It was aloft for four years and ten months, completing 27,785 orbits of the earth. Salyut 7 Russian manned space station, launched 1982-04-19. Salyut 7 was the back-up article for Salyut 6 and very similar in equipment and capabilities. However the crews were able to conduct significant military experiments due to the greatly increased volume and payload of the TKS modules diverted from the cancelled Almaz program that docked with the station. Saturn LCB-Storable-140 stage N2O4/UDMH propellant rocket stage. Boeing Low-Cost Saturn Derivative Study, 1967 (trade study of 260 inch first stages for S-IVB, all delivering 86,000 lb payload to LEO): Low Cost Booster, Single Pressure-fed N2O4/UDMH Propellant engine, HY-140 Hull. Saturn LCB-Storable-250 stage N2O4/UDMH propellant rocket stage. Boeing Low-Cost Saturn Derivative Study, 1967 (trade study of 260 inch first stages for S-IVB, all delivering 86,000 lb payload to LEO): Low Cost Booster, Single Pressure-fed N2O4/UDMH Propellant engine, Ni-250 Hull. Saturn PFL N2O4/UDMH propellant rocket stage. NASA, Saturn Alternative Booster Studies, 1969 (trade study of 120, 156, 260 inch solid, and Storable liquid boosters for S-IVB. Reached opposite conclusion from Boeing study, that Pressure Fed Liquid Booster would be 6.5% more expensive than solid). Pre. SE-1, 1-1, -2, and -4 Series Rocketdyne N2O4/UDMH rocket engine. SE-1, 1-1, -2, and -4 Series. Spacecraft Reaction Control. Pressure-fed. Multiple thrust levels. First flight 1959. SE-5-2/-3 Rocketdyne N2O4/UDMH rocket engine. SE-5-2/-3. Agena Auxiliary. Pressure-fed. SE-5-2 four engines in satellite system. SE-5-3 two engines for Agena auxiliary propulsion. First flight 1963. Soyuz 7K-LOK Russian manned lunar orbiter. The two-crew LOK lunar orbiting spacecraft was the largest derivative of Soyuz developed. Manned Lunar orbit and return satellite, Russia. Launched 1972. Soyuz 7K-S Russian manned spacecraft. The Soyuz 7K-S had its genesis in military Soyuz designs of the 1960's. Launched 1974 - 1976. Soyuz T Russian manned spacecraft. Soyuz T had a long gestation, beginning as the Soyuz VI military orbital complex Soyuz in 1967. Launched 1978 - 1986. Soyuz T PAO Russian manned spacecraft module. 18 launches, 1978.04.04 (Cosmos 1001) to 1986.03.13 (Soyuz T-15). Improved PAO service module derived from Soyuz 7K-S with pressure-fed main engines and unitary RCS/main engine propellant feed system. Equipment-engine section. Soyuz TM Russian manned spacecraft. Launched 1986 - 2002. Soyuz TM PAO Russian manned spacecraft module. 34 launches, 1986.05.21 (Soyuz TM-1) to 2002.04.25 (Soyuz TM-34). Further improvement of Soyuz T PAO service module with pressure-fed main engines and unitary RCS/main engine propellant feed system. Equipment-engine section. Soyuz TMA Russian three-crew manned spacecraft. Designed for use as a lifeboat for the International Space Station. After the retirement of the US shuttle in 2011, Soyuz TMA was the only conveying crews to the ISS. Except for the Chinese Shenzhou, it became mankind's sole means of access to space. Launched 2002 - 2011. Soyuz TMA PAO Russian manned spacecraft module. Operational. First launch 2002.10.30. Further improvement of Soyuz T PAO service module with pressure-fed main engines and unitary RCS/main engine propellant feed system. Equipment-engine section. Stepanov IS/US 1 kgf Stepanov N2O4/UDMH rocket engine. IS/US. Out of Production. Stepanov IS/US 16 kgf Stepanov N2O4/UDMH rocket engine. IS/US. Out of Production. Stepanov LK/LOK 10 kgf Stepanov N2O4/UDMH rocket engine. LK/LOK attitude. Out of Production. Stepanov LK/LOK 40 kgf Stepanov N2O4/UDMH rocket engine. LK/LOK attitude. Out of Production. TKS Vladimir Chelomei's TKS manned ferry vehicle was designed to provide a reusable resupply and crew return spacecraft much more capable and flexible than either the Soyuz or Apollo designs. Although the TKS completed its development program as part of the military Almaz space station program it was never used for manned spaceflight. However the TKS resupply vehicle provided the basis for the successful FGB space station modules used with the Salyut, Mir, and International Space Station. The original TKS was launched four times, from 1977.07.17 (Cosmos 929) to 1985.09.27 (Cosmos 1686). TKS FGB Russian manned spacecraft module. 4 launches, 1977.07.17 (Cosmos 929) to 1985.09.27 (Cosmos 1686). Orbital Living and Service Module. Topaze SEP N2O4/UDMH rocket engine. Out of production. Used on Diamant launch vehicle. First flight 1965. Topaze VE111-1 N2O4/UDMH propellant rocket stage. Topaze VE111L-1 N2O4/UDMH propellant rocket stage. Tsyklon 2-1 N2O4/UDMH propellant rocket stage. SL-11; 11K68;R-36M. Tsyklon 2-2 N2O4/UDMH propellant rocket stage. .
Tsyklon 2-3 N2O4/UDMH propellant rocket stage. Integral portion of payload. Tsyklon 3-1 N2O4/UDMH propellant rocket stage. SL-14;11K69. Tsyklon 3-2 N2O4/UDMH propellant rocket stage. .
Tsyklon 3-3 N2O4/UDMH propellant rocket stage. .
UR-100N MIRV Bus N2O4/UDMH propellant rocket stage. .
UR-100N Stage 1N N2O4/UDMH propellant rocket stage. .
UR-100N Stage 2N N2O4/UDMH propellant rocket stage. Engine has one main engine and four verniers. Verniers continue to burn for 19 seconds after main stage shutoff. UR-200-1 N2O4/UDMH propellant rocket stage. TsNIIMash has 1:10 structural simulation model. Developed 1960-1965. Orevo has sectioned hardware. All data accurate except empty mass prorated between first and second stages. UR-200-2 N2O4/UDMH propellant rocket stage. TsNIIMash has 1:10 structural simulation model. Developed 1960-1965. Orevo has sectioned hardware. All data accurate except empty mass prorated between first and second stages. UR-500-2 N2O4/UDMH propellant rocket stage. Proton UR-500 second stage. Flew only on two-stage version of Proton. Empty mass is correct; all other values estimated based on UR-500 Stage 2 original design and UR-500K stage 2 figures. UR-700-1 N2O4/UDMH propellant rocket stage. Includes propellant tanks which fed stage two engines from liftoff to first stage cutoff. UR-700-2 N2O4/UDMH propellant rocket stage. .
UR-700-3 N2O4/UDMH propellant rocket stage. .
UR-700-4 N2O4/UDMH propellant rocket stage. Estimated empty mass. Three used to propel LK-700 spacecraft towards moon. Vexin A SEP N2O4/UDMH rocket engine. Used on Europa launch vehicle. First flight 1964. Vexin B SEP N2O4/UDMH rocket engine. Out of production. Used on Diamant launch vehicle. First flight 1965. Vexin C SEP N2O4/UDMH rocket engine. Out of production. Used on Diamant B launch vehicle. First flight 1970. Viking 2 SEP N2O4/UDMH rocket engine. In production. Used on Ariane 1, GSLV space launchers. First flight 1979. Viking 2B SEP N2O4/UDMH rocket engine. Used on Ariane 2/3. First flight 1984. Viking 4 SEP N2O4/UDMH rocket engine. Used on Ariane 1, GSLV, PSLV. First flight 1979. Viking 4B SEP N2O4/UDMH rocket engine. Used on Ariane 4. First flight 1984. Viking 5C SEP N2O4/UDMH rocket engine. Used on Ariane 42L, Ariane 44L, Ariane 44LP. First flight 1988. Volna-1 N2O4/UDMH propellant rocket stage. Volna-2 N2O4/UDMH propellant rocket stage. Vysota-1 N2O4/UDMH propellant rocket stage. YF-20A Beijing Wan Yuan N2O4/UDMH rocket engine. Out of production. Boosted CZ-2A, CZ-2C, CZ-2E(A), CZ-3, FB-1. First flight 1972. YF-20B Beijing Wan Yuan N2O4/UDMH rocket engine. In production. Boosted CZ-2C, CZ-2D, CZ-2E, CZ-2E(A), CZ-3A, CZ-3B, CZ-3C, CZ-4A. First flight 1988. YF-22 Beijing Wan Yuan N2O4/UDMH rocket engine. In Production. YF-22/23 Beijing Wan Yuan N2O4/UDMH rocket engine. Out of production. Cluster of YF-22 and 4 x YF-23 verniers. Boosted CZ-2A, FB-1. First flight 1972. YF-22A/23A Beijing Wan Yuan N2O4/UDMH rocket engine. Out of production. Cluster of YF-22A and 4 x YF-23 verniers. Boosted CZ-2C, CZ-3. First flight 1975. YF-22B SAST N2O4/UDMH rocket engine. YF-23 Beijing Wan Yuan N2O4/UDMH rocket engine. In Production. Used as vernier motor with YF-22 and YF-25. YF-25 Beijing Wan Yuan N2O4/UDMH rocket engine. In Production. YF-25/23 Beijing Wan Yuan N2O4/UDMH rocket engine. In production. Cluster of YF-25 and 4 x YF-23 verniers. First stage engine for CZ-2D, CZ-2E, CZ-2E(A), CZ-3A, CZ-3B, CZ-3C, CZ-4A. First flight 1988. YF-40 Beijing Wan Yuan N2O4/UDMH rocket engine. Out of production. Used on CZ-4A launch vehicle. First flight 1988. Zarya NO Russian manned spacecraft module. Cancelled 1989. Maneuver system consisted of two engines, each of 300 kgf. Expendable module for orbital maneuvering and experiments. Zyb Mod 2-1 N2O4/UDMH propellant rocket stage. Engines: SE-1, 1-1, -2, and -4 Series, Isayev Polet/IS, RD-250, Stepanov IS/US 1 kgf, Stepanov IS/US 16 kgf, RD-0203, RD-0204, RD-0205, RD-0206, RD-0208, RD-0209, RD-251, RD-252, 8D43 + 11D43, RD-0210, RD-0211, RD-0212, RD-0213, RD-0214, RD-0215, RD-254, SE-5-2/-3, 8D725, RD-0217, 8D423, Stepanov LK/LOK 10 kgf, Stepanov LK/LOK 40 kgf, RD-0229, RD-261, RD-262, RD-253-UR-700, 11D423, KRD-61, Izotov LK-700, RD-0233, RD-0235, RD-0237, RD-263, RD-264, RD-268, KTDU-425, Isayev TKS attitude, KTDU-425A, RD-273, RD-274, RD-0244, RDMT-400A, RD-263F, RD-275, RD-0255, RD-869, RDMT-400 X, RDMT-8 X, CZ-1C-3 engine, RD-253-14D14, 11D446, 17D58E, 11D23, 11D416, 11D428, 11D43, 11D430, 11D431, 11D445, 11D458, 11D79, 15D13, 17D61, 4D10, 51T6B ZhRD, 8D43, DMT-600, DST-100, DST-200, DST-25, DST-100A, DST-200A, Izotov UR-100 stage 2 vernier, KRD-79, KTDU-417-B, KDU-426, KRD-442, KTDU-80, MD-620 engine, MR-UR-100 BR, NII 612 kgf, PF N204/UDMH-2165k, PF N204/UDMH-2912k, Press Fed 1000k, Press Fed 200k, Press Fed 5748k, RD R-29 (1), RD R-29 (2), RD R-29R (1), RD R-29R (2), RD R-29RM (2), RD R-29RM (3), RDMT-100, RDMT-200, RDMT-400, RDMT-50, RDMT-12, RDMT-135, RD R-27, RD-253-11D48, RDMT-0.4 X, R-39 St2, R-39 St3, R6-117, RD R-21, RD-0202, RD-0207, RD-0216, RD-0221, RD-0225, RD-0228, RD-0230, RD-0231, RD-0232, RD-0234, RD-0236, RD-0242, RD-0243, RD-0245, RD-0246, RD-0250, RD-0251, RD-0256, RD-0257, RD-253, RD-270, RD-68M, RD-69M, RD-854, RD-855, RD-856, RD-857, RD-858, RD-859, RD-860, RD-861, RD-861G, RD-861K, RD-862, RD-863, RD-864, RD-866, RD-868, S5.51, S5.92, S5.98M, Topaze, Viking 2, Viking 4, Vexin A, Vexin B, Viking 2B, Viking 4B, Vexin C, Viking 5C, YF-22, YF-22/23, YF-25/23, YF-3, YF-25, YF-20A, YF-22A/23A, YF-20B, YF-22B, YF-23, YF-40. Spacecraft: Apollo CSM, Apollo SM, LK-1, LEAP lunar flyer, LM Langley Light, LK-700, Apollo CSM Block I, Almaz APOS, Gemini - Double Transtage, LK-1 PAO, Gemini Lunar Surface Rescue Spacecraft, Gemini LSRS AM, Gemini LSRS LM, Gemini LSRS LOIM, Rescue Gemini, Apollo RM, Gemini Lunar Surface Survival Shelter, Gemini LSSS LM, Gemini LORV, Gemini LORV SM, LK-700 Block 1, LK-700 Block 11, LK-700 Block 111, LK-700 VA, LK-700 Block 1V, Big Gemini AM, LK, Soyuz 7K-LOK, LOK PAO, Almaz OPS-2, LK-3, Almaz OPS, LEK PS, LEK VS, Soyuz 7K-S, MTKVA, TKS, Salyut 6, TKS FGB, Soyuz T, Soyuz T PAO, 37K-Mir, Salyut 7, OK-M, OK-M1, OK-M2, Mir, Soyuz TM, Almaz-T, Soyuz TM PAO, LOK Energia PAO, LK Energia PS, LK Energia VS, Progress M, Progress M PAO, Zarya NO, Almaz-1B, Almaz-2, Soyuz TMA, Soyuz TMA PAO, Angara Briz M. Launch Vehicles: Proton. Stages: Martlet 4L-3, Martlet 4L-2, AVUM, Ikar stage, CZ-1C-3, Fregat, Burlak Stage 2, MR-UR-100-2, RT-23-3, R-21-1, Burlak Stage 1, R-29-1, Grom-2, UR-200-2, R-56 Block O, UR-700-4, R-36-2, UR-200-1, R-36-1, LCLV-3, R-56 Block B, UR-700-3, LCLV-2, UR-700-2, R-56 Block A, UR-700-1, LCLV-1, Daniel-2, Monoblock UR-500-1M, Monoblock UR-500-2, Monoblock UR-500-3, Polyblock UR-500-1P, UR-500-2, Topaze VE111-1, Proton K-1, Proton K-2, Proton K-3, Topaze VE111L-1, Saturn LCB-Storable-140 stage, Saturn LCB-Storable-250 stage, 8K94 stage, Saturn PFL, Europa-2, R-36-0-1, R-36-0-2, Ariane 1-1, Ariane 1-2, FB-1-1, FB-1-2, Ariane 2-1, Ariane 2-2, 8S816, 8S817, Ariane 4-0-4L, Ariane 4-1, MR-UR-100 St 1, MR-UR-100-3, Perimetr Stage 1, CZ-4A-3, Zyb Mod 2-1, Vysota-1, Vysota-2, CZ-2C/SD-2, CZ-3A-1, A-350-1, A-350-2, CZ-2E(A)-0, Proton M-1, Proton M-3, A-925-2, Angara Briz M stage, Briz-KM, CZ-2C-1, CZ-2E-1, CZ-3-1, CZ-4A-1, CZ-1D-2, CZ-2C-2, CZ-2E-2, CZ-3-2, CZ-3A-2, CZ-4A-2, CZ-4B-2, CZ-4B-3, Diamant B-1, Diamant-1, Diamant-2, GSLV-0, GSLV-2, Jericho-1-1, LB-40, NA 802 Soleil C, NA 803 Soleil, PSLV-2, Proton KM-4 Briz M, R-36M-1, R-36M2-1, R-36M-2, R-36M2-2, R-36M2-3, Rif-3, Rokot-3 Briz, Shtil'-2, Shtil'-1-3, Tsyklon 2-1, Tsyklon 3-1, Tsyklon 2-2, Tsyklon 3-2, Tsyklon 2-3, Tsyklon 3-3, Titan Transtage, UR-100N Stage 1N, UR-100N Stage 2N, UR-100N MIRV Bus, Volna-1, Volna-2.